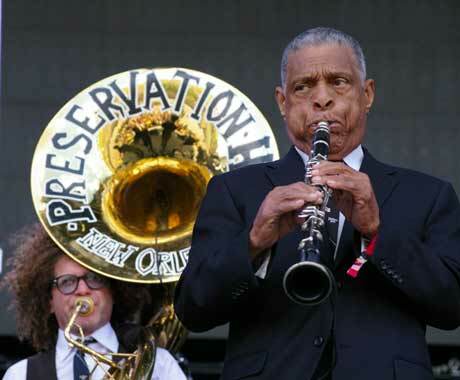 If the Sasquatch line-up was organized purely by talent, the Preservation Hall Jazz Band would have played at midnight. There is no star in this New Orleans institution; every member was virtuosic. Even the tuba players got to throw their own flourishes into the evolving tapestry of organized soloing, a selfless style of play of the people and for the people. It's stupefyingly joyous music, free from fickle pop trends and marketing tactics, as much a chin-stroking history lesson as an invocation to break out some swing dancing and lindy-hopping, which several pockets of people happily did. One would have had to be made of stone not to get caught up in the call-and-response of "Little Liza Jane" and "Shake That Thing" or the sweet crooning of 80 year-old clarinetist Charlie Gabriel. This is the original hipster music, the true hep-cat candy, which brought the raunchy Treme flavour to the main stage.